When we reviewed Intel's SSD DC S3700 I started looking at consistency of IO latency, an area that Intel's latest controller specifically targeted for significant improvement. In our review of OCZ's Vector I took the same methodology and applied it to the current crop of high-end consumer drives. As I believe improving IO consistency is a good optimization practice for all SSDs, the hope is that we'll see improvements in this area on both client and enterprise focused drives. In the comments thread for the Vector review, jwilliams4200 posted some very interesting data. The S3700 has 264GiB of NAND on-board but only exposes 186GiB of it (200GB advertised capacity) as user accessible storage, the rest is used as spare area to improve performance, consistency and endurance. Most client drives on the other hand only feature about 7% of their total NAND capacity set aside as spare area (256GiB of NAND, 238GiB of user storage). The obvious hypothesis is that a big part (if not all?) of the S3700's advantage in performance consistency is due to the large amount of spare area. With more spare area, write amplification is lower. The controller has more room and thus flexibility with running its defragmentation and garbage collection algorithms. The dreaded read-modify-write scenario is triggered less frequently as there's less space pressure thanks to additional spare area. If you're testing in a full-drive scenario, there's simply less data to keep track of when you've got more NAND set aside as spare area. This keeps internal data structure footprints smaller by default, which also improves performance. It's because of this relationship between write amplification and spare area that we've always recommended setting aside 10 - 20% of your SSD and not filling it up entirely. Most modern controllers will do just fine if you partition the drive and leave the last 10 - 20% untouched. With TRIM support even the partitioning step isn't really necessary, but it does help from a data management standpoint. The real question is what's the relationship between spare area and IO latency/performance consistency. To find out, I repeated jwilliams4200's tests. I took a bunch of 240/256GB drives and filled them to various percentages of their capacity, and performed our IO consistency test with an identical span of LBAs. 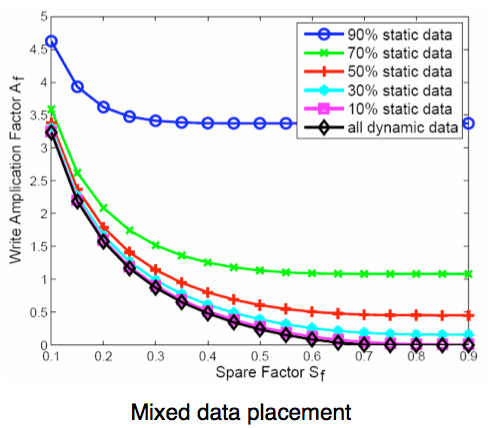 The goal was to simulate worst case IO consistency while taking into account greater percentages of spare area. 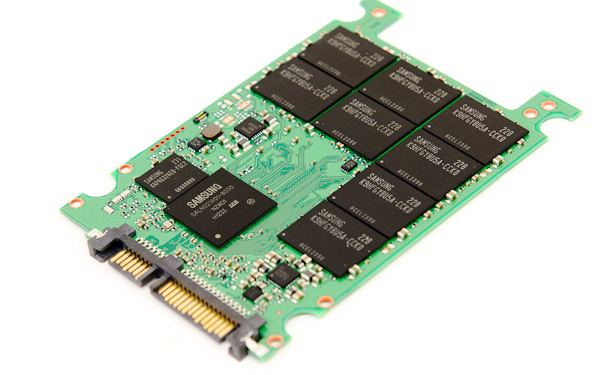 For this investigation I picked a couple of the most interesting, modern SSD controllers: Samsung's MDX controller from the SSD 840 Pro, Link A Media Devices' LM87800 controller from Corsair's Neutron and Barefoot 3 from OCZ's Vector. For all of these drives I used 256GB capacities. With the exception of the Neutron, all of the drives had ~7% of their NAND capacity set aside as spare area. The Neutron is a 240GB drive after its ~12% spare area. The high level testing methodology remains unchanged from our S3700 review. Unlike in previous reviews however, I did vary the percentage of the drive that I filled/tested depending on the amount of spare area I was trying to simulate. The buttons are labeled with the advertised user capacity had the SSD vendor decided to use that specific amount of spare area. If you want to replicate this on your own all you need to do is create a partition smaller than the total capacity of the drive and leave the remaining space unused to simulate a larger amount of spare area. The partitioning step isn't absolutely necessary in every case but it's an easy way to make sure you never exceed your allocated spare area. It's a good idea to do this from the start (e.g. secure erase, partition, then install Windows), but if you are working backwards you can always create the spare area partition, format it to TRIM it, then delete the partition. Finally, this method of creating spare area works on the drives I've tested here but not all controllers may behave the same way. I recorded instantaneous IOPS every second for the duration of the test. 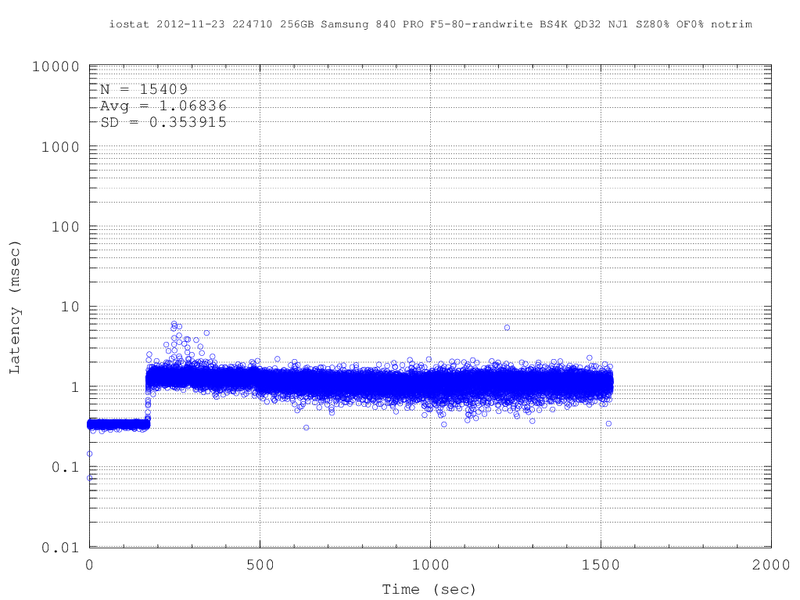 I then plotted IOPS vs. time and generated the scatter plots below. Each set of graphs features the same scale. The first two sets use a log scale for easy comparison, while the last set of graphs uses a linear scale that tops out at 40K IOPS for better visualization of differences between drives. The first set of graphs shows the performance data over the entire 2000 second test period. In these charts you'll notice an early period of very high performance followed by a sharp dropoff. What you're seeing in that case is the drive alllocating new blocks from its spare area, then eventually using up all free blocks and having to perform a read-modify-write for all subsequent writes (write amplification goes up, performance goes down). 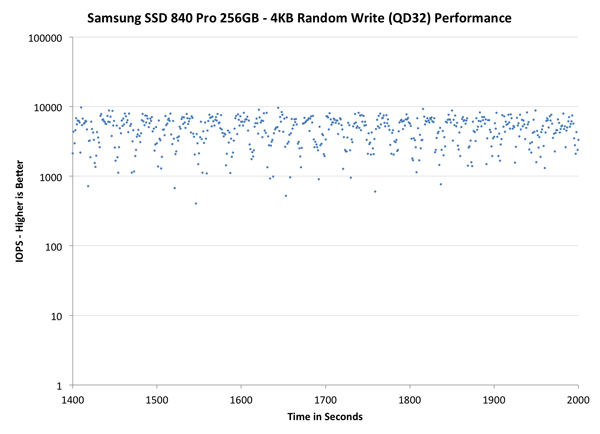 I ran the most data on Samsung's SSD 840 Pro as it's likely going to be the most popular of the drives here. If you click through the various simulated capacities/spare area points you'll see the drive's performance consistency improves tremendously once you hit 25% spare area. The drive's IO consistency goes from a spread out mess to something that resembles a thickly painted line across the graph. At 50% spare area, the 840 Pro begins to lose that initial performance cliff and instead develops a much flatter curve. Compared to the S3700 there's still some obvious variation in IO latency (and thus performance) but it's far more controlled than in the default configuration. 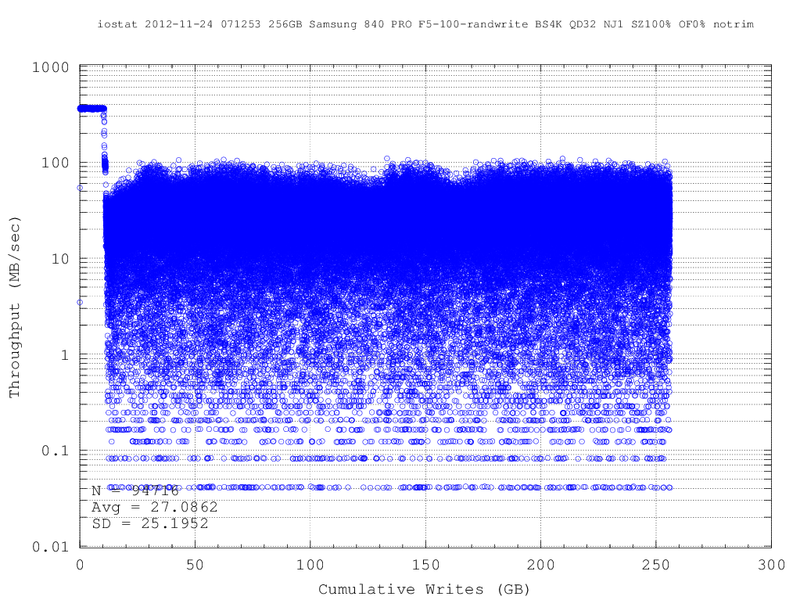 OCZ's Vector behaves similarly. The individual IOs on the Vector with 25% spare area are more tightly grouped than on the 840 Pro in general, but you can see OCZ's periodic defrag routine kick in with regular blips that deviate below the curve. The LAMD based Neutron is actually remarkably consistent even in its default configuration. I originally didn't include the Neutron but Kristian theorized that LAMD's enterprise experience could make for an interesting datapoint here. He was right. 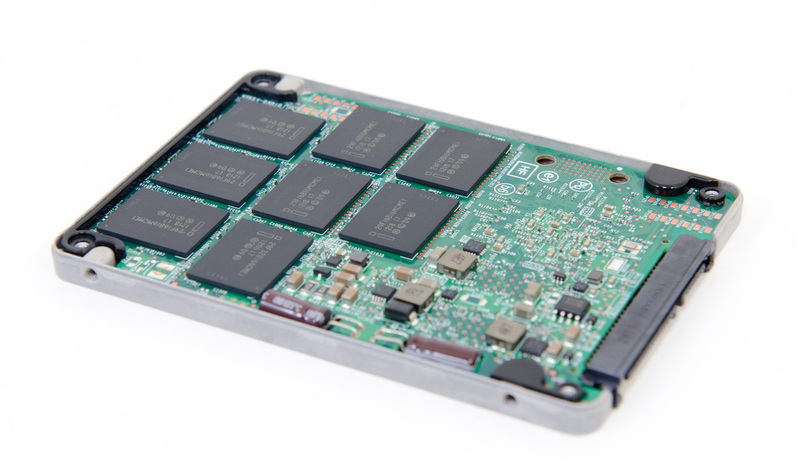 The Neutron remains one of the most consistent SSDs out of the box without dedicating any additional spare area to the controller. 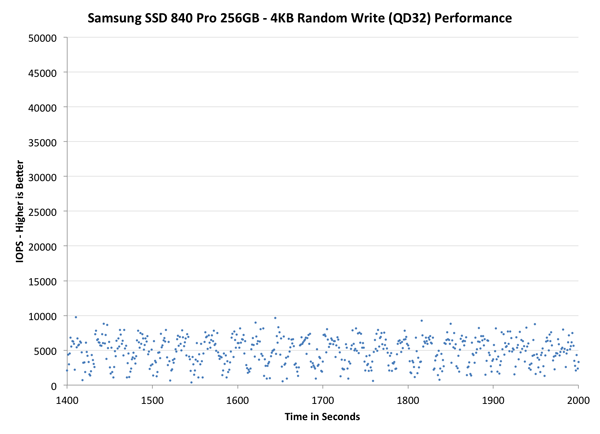 Even compared to Samsung's SSD 840 Pro at 225GB, the Neutron manages to deliver more consistent performance. The Neutron's curve tightens up at 25% spare area but there's still a good amount of variance. 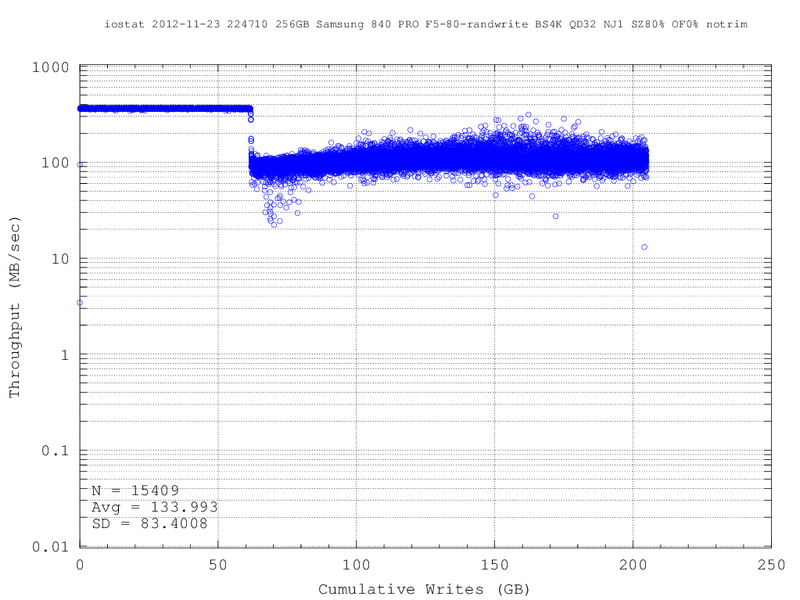 The LAMD defrag routines don't look as predictable/periodic as we've seen on other drives, including the S3700. I wonder if the controller is doing something a bit more dynamic here. The next set of charts look at the steady state (for most drives) portion of the curve. Here we'll get some better visibility into how everyone will perform over the long run. 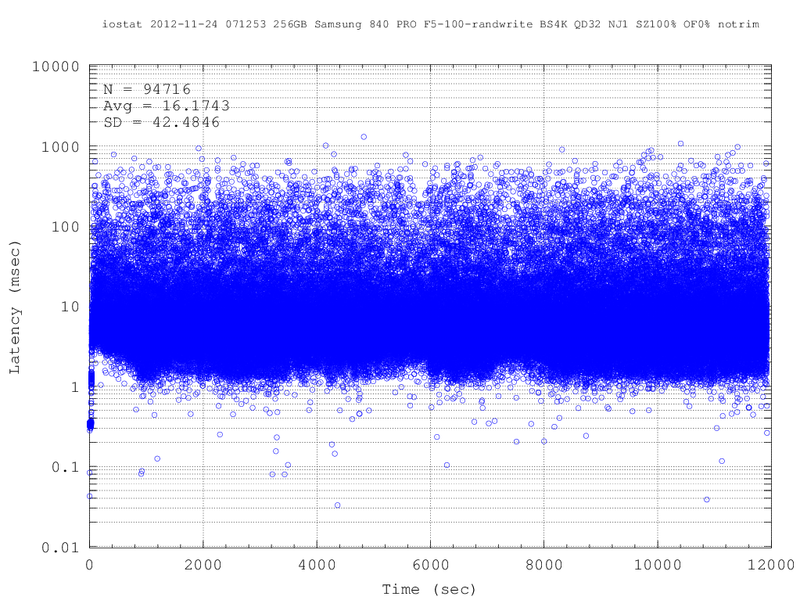 The scale isn't different here, but we do get a better look at steady state consistency. The Neutron continues to impress, looking almost identical to the S3700 if you give up 25% of the drive's NAND to spare area. Samsung also does very well at 25% spare area, there's just a huge improvement there. Zooming in and looking at a linear scale does show us that additional spare area alone isn't enough to deliver the degree of consistency that Intel's S3700 offers. The solution really has to be a combination of controller and spare area. It's also entirely possible that a controller that prioritizes IO consistency would be able to offset the need for significant spare area. That's definitely the case with Corsair's Neutron, and I'd assume that future derivaties of Intel's S3700 with standard MLC and less spare area will behave similarly. For most consumers this likely won't matter as minimum performance improves substantially once you hit 25% spare area for these drives, but enterprise customers with several if not dozens of SSDs in a RAID array will still benefit from the S3700's architecture. Delivering consistent performance is an important part of improving user experience. As Intel's SSD DC S3700 and Corsair's Neutron have shown, consistent performance is possible through a controller that prioritizes efficient and aggressive defragmentation. I do believe it is important for controller vendors to prioritize IO consistency in their controller and firmware designs. For drives on the market today that don't already prioritize consistent IO, it is possible to deliver significant improvements in IO consistency through an increase in spare area. OCZ's Vector and Samsung's SSD 840 Pro both deliver much better IO consistency if you simply set aside 25% of the total NAND capacity as spare area. Consumer SSD prices are finally low enough where we're no longer forced to buy the minimum capacity for our needs. Whatever drive you end up buying, plan on using only about 75% of its capacity if you want a good balance between performance consistency and capacity. On the last article someone was pondering the same sort of question. It sounds like that is not the case, and if the area is flagged as part of a partition, then it is not treated as spare area; hence the need to turn that area into its own partition, format it, and then delete it. I would have thought the free space on a partition is free to use as spare area as the drive needs. It sounds like the partitioning is just to stop you accidentally filling it up more than you need. Are you looking at the linear-axis graphs? They show you can still get quite a variation in performance despite the 25% spare area, but it's still a tighter range and overall faster than 12%. What would make a big difference is how your C300 controller makes use of this spare area. 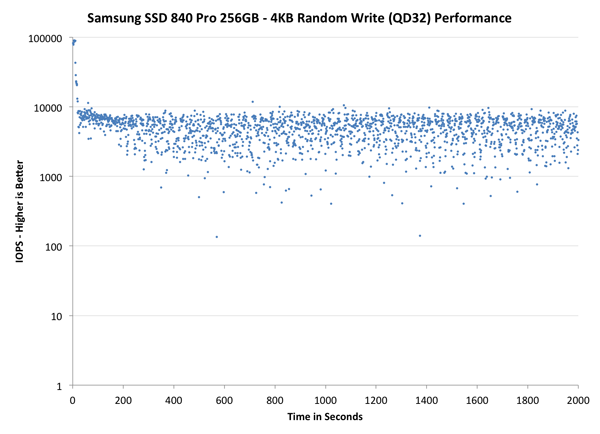 I'd certainly like to see these graphs for a wider spectrum of SSDs, though I understand that it all takes time. The Samsung SSD software (Samsung Magician) creates spare area on your drive by shrinking the existing partition by 20% and leaving the free space unallocated. This suggests that the spare area used is not free space from the partioned area, but only unallocated space. For normal consumer usage, the Samsung840 Pro is the best, but it performs the worst of all here. The Corsair Neutron is worst of all three in desktops usage, but performs the best here. That's a stunning revelation to me. I had no clue SSD i could increase the I/O performance manyfolds by simply increasing the spare area. Thank you Anand and jwilliams4200.